Yesterday we went a shrine for praying easy delivery. There were lots of couples and families waiting their baby. 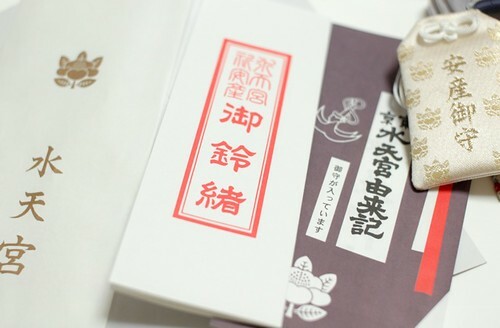 In Japan, people go to shrine in the second month of pregnancy. They put a kind of obi on the day praying safe delivery. In my case, my friend went to a famous shrine for me and sent these items to me. The most right one is an amulet for safe delivery. There is a small square piece of paper to drink when I feel bad or at labor pain. And the last one is a piece of cotton which to put the obi. If one doesn't want to put the obi during pregnancy, she can put it in her pouch or bag (I'm doing so). These days women don't use the obi so much because it's too tight and said not so good for their baby. My doctor didn't tell me about the obi so I don't put it but when I get bigger I put some kinds of girdle. 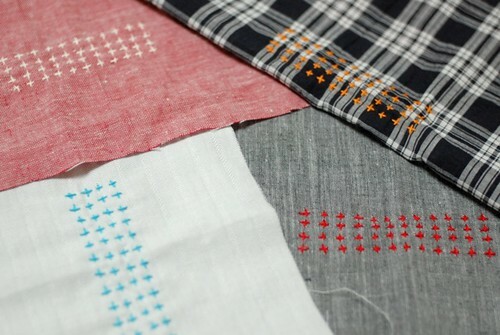 By the way, I began making new items on my shop with Sashiko stitch. It's very easy (* v *). I just did four running stitch lines. Then, turn it in 90 degrees and do the same making crosses. I did the same on four kinds of cotton fabrics. What they are for? Please wait for my next post. Keeping you in my prayer for a safe delivery of baby. I send you my best wishes and I would like to tell you that you have a person who everyday thinks of you here in México, and send you my best hopes for a safe pregnancy and a really easy and safe delivery. Thanks for sheering your thoughts and the Japanese way , of pregnancy . thank you for your lovely blog and needle-work. Your work is really inspiring and I am also keen on learnig about the Japanese way of life. I am from Germany. And best wishes for you and your little tomatoe, my youngest doughter is 8 month old. Good look! 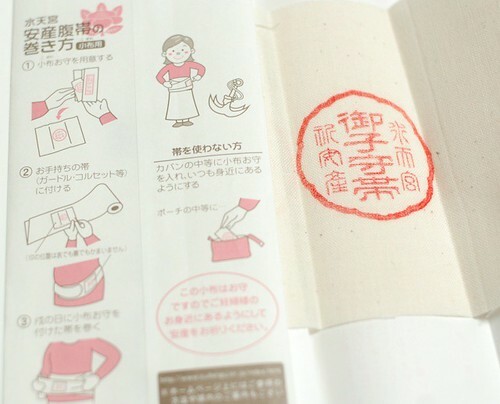 Love reading about traditions for mothers-to be in Japan! And I can't wait to see the project you are going to use the embroidered pieces for. This is the journey to become a mother..you'll love it :)Love to hear your journey toward motherhood. What a beautiful tradition! I will pray for you and your little Tomato. :) I was reading about the Shashiko stitch not too long ago. I would like to try it some time. Your work is so pretty. I love your blog and your posts. How great! Yesterday I wrote about learning Sashiko and today you show some details. Thanks a lot and I am curious, what you used it for. Here in Cologne, we don't go to a shrine, but we lit a candle in our wonderful gothic cathedral. If you don't mind the Christian surrounding, I would love doing it for your little growing family. I am sure, it works for everybody. Many blessings for you, your baby and your family! It's very impressive to learn about the traditions different nations follow during pregnancy! But how come obi's are used? Aren't they used while wearing kimonos? I wish you and your husband a wonderful pregnancy. hehe! <3~ Stay Yourself! Mai, thank you for sharing the traditions with us. I completely believe that learning about other peoples is the only way we can become a more peaceful and united planet Earth! Blessing and prayers for you, Haru and Tomato! 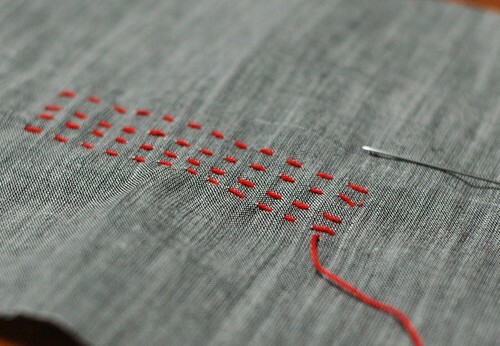 i found your blog by accident.. i'm learning how to sew slowly.. and OMG i'm in love with your works!! Best wishes for your pregnancy and delivery! 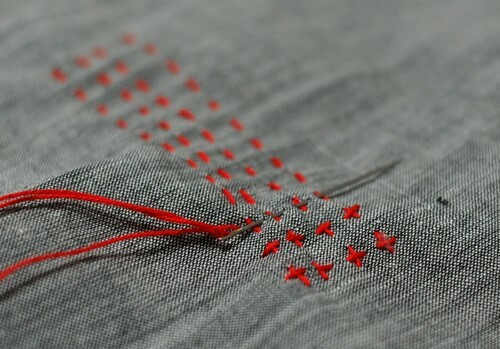 The sashiko stitching is lovely. I can't wait to see what you're going to make with it. I will add to your prayers for a safe and easy delivery of your dear tomato. I have just discovered you blog and love it. Good Luck with your pregnancy.Your hand-stitching is beautiful, you are very talented. Mai, all the best for your pregnancy and also for the delivery. that's an interesting tradition! here we do the same, people go to church to pray for easy delivery ^^. 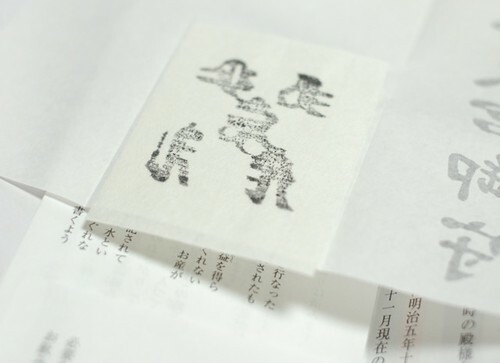 your sachiko embroidery is beautiful! You could have such a more powerful blog if you let people SEE what you're talking about instead of just reading it.